Côte d'Azur | Alicia S.
If you’ve been following me on social media for a while you might know I went to the French Riviera last November and I’ve been in love with it ever since. I was there for three days with my mother-well, two but one day was the bus ride to get there (approx. 9 hours) We were in a group with people all over Slovenia and we had organized transport (bus) and tours. 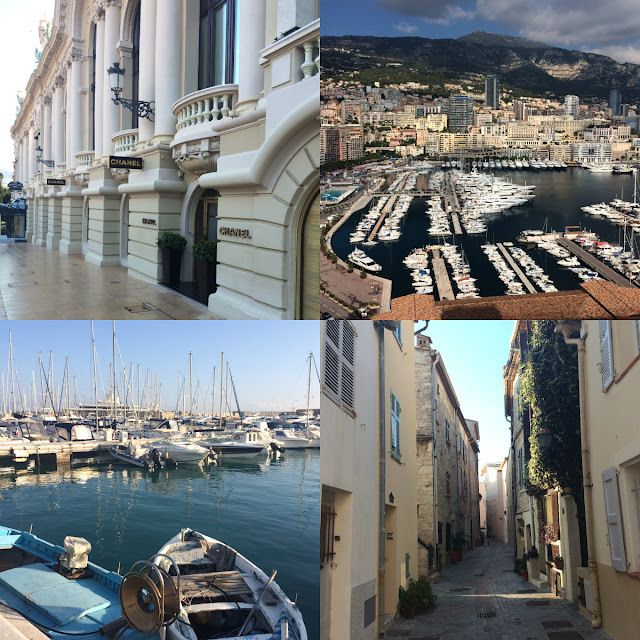 We visited Monaco, Nice, Eze, Antibes and Cannes. If you want to find out more, please keep on reading or scroll down for a photo gallery. We met at the arranged place and time (around 10 in the evening) and left for Monaco. We arrived there at around 7/8 in the morning and the city was still sleeping. We were only there till lunch time unfortunately but it was enough for me to fall in love with this little country. Monaco is the second smallest country in the world with only 2,02 square kilometers area and the population of 36,371 Monancans. Even though this country is really small, the land is fully used and populated, they build high buildings with green gardens at the roof tops. It’s well known for the local royal family, the Grimaldi family. Monaco is a constitutional monarchy with Prince Albert II. as the head of state. Monaco is also known for Grace Kelly, the famous actress who married Prince Rainier and died in a car crash but her spirits is still alive in many Monacan’s hearts. Also, the annual Monaco Grand Prix formula one race is well known here for it’s prestige and luxury. The circuit is really narrow and tight, because it runs through the streets of Monaco. It’s also considered a tax haven, because there is no income tax on individuals, that’s the reason for many luxurious villas, hotels and yachts-it attracts many business people. We started our tour at Monaco’s Capitainerie a.k.a. Port. I’ve never seen so many luxury yachts and cars in one place! It was actually quite warm, like 25°C and I only brought sweaters and long sleeve shirts with me because I wasn’t expecting that it would be this warm. After Port, we continued our tour through the city. We stopped at the famous Hotel Paris which is most known among celebrities, but it was under construction at the time so we didn’t get to see it in it’s full glory. Our next stop was at the near by Monte Carlo Casino known for the many James Bond movies and poker tournaments. Fun fact: the citizens of Monaco are not allowed to enter the Casino (there goes my plan to move to Monaco, oh well I might as well move to Nice). Not to mention how many luxury stores the Casino and Hotel are surrounded with! Another famous building was right next to the Casino, it’s the famous Cafe de Paris. In the morning it was nearly empty, but at night it comes alive. It’s known that all sorts of celebrities fill this place and the vibe there must be amazing. We then moved on to the Oceanographic museum, which was optional, so me and my mum decided to discover the city instead. We were walking down the narrow streets, looking for a cheap but good place to eat some brunch. While looking for the perfect spot we also stopped at some souvenir stores where I bought myself a golden necklace with my name on it. We found this lovely coffee shop (with wi-fi!!) and ordered two cappuccinos and two paninos (italian bread sandwiches- a panino) with chicken. It was delicious and I was able to post some photos on my snapchat and instagram. We had two hours before we met back at the bus and traveled on to Eze. Eze is a small village near to Nice and Monaco. We stopped at the Fragonard Perfumeur, a factory where they make perfumes, soaps, oils and cremes. It was really interesting to see how they make perfumes from rose petals or other flowers. My mum bought some soap in the shape of eggs, packed in an egg cartons and they smell amazing. At the factory parking space there was also rent a Ferrari agency with one red Ferrari parked in front of it (well, it was really near to Monaco so I’m not even surprised). We also visited the Castle which was right above the luxurious Hotel Chateau Eza with five stars. Our tour guide gave us one hour to see the castle and grab some coffee, then we were off to Nice. It was around 6 pm when we arrived to our hotel in Nice. We had one hour to relax and then the tour guide would take us on a small tour to the city center. We unpacked and relaxed for a while and we were off to the city center. I was amazed by Nice’s architecture. It was France at it’s finest! After the tour guide finished with the tour we could either return to the hotel or take a walk on our own. Me and my mum decided to take a walk through the city and do some shopping. We stopped at Mac, Lush, Sephora, Pull&Bear, Zara, Mango and many other stores. We got to experience the city on our own. We got really hungry so I decided to grab some sushi and macrons and mum grabbed something from the local supermarket. We also had some coffee at Starbucks and I learned that Alicia is quite a common name in France. On our way back to the hotel we got lost (luckily we knew the name of our hotel so I typed it into google maps and we found the hotel in no time). When we arrived we went straight to bed, sleeping on a bus is no fun trust me. Next morning we had breakfast at the hotel. It was a light, french breakfast-croissants, bread rolls, coffee, orange juice and some fruit. Slovenians are not used to such a light breakfast because I heard a lot of them complaining about it later (haha). After breakfast, we were off to Antibes and later Cannes. Our view of Antibes from bus didn’t impress me much, it looked like just another small city with a huge port but later on, while discovering the streets of Antibes I fell in love with it. We had coffee at this lovely cafe, Le Clemenceau. I bought myself a french Vogue and a chocolate eclair and we ordered two cappuccinos at this cafe. It was really lovely, I’d love my every morning to be like this. Careless walks through quiet, narrow streets and by the ocean, oh such a dream! They also had a Picasso museum, but we were there pretty early and it was still closed. After two hours there, we were off to Cannes, our final destination. First, we stopped at the well known Palais des Festival et des Congres. Every year, the celebrities fill this place up because of the annual Cannes Film Festival. Outside the building there were hand-prints of some worlds most famous celebrities (Angelina Jolie for example). After a short tour around the city we had an hour and half to discover the city. Me and my mum decided to go shopping, again. There were a lot of high street stores and also a street with high end stores and luxury hotels for the most exquisite guests. After a quick shopping spree, we returned to our bus and our ride home has begun. Overall it was an incredible experience, but next time I’d love to go with a friend on our own, without a tour guide and experience the French Riviera on our own. I was so inspired by the amazing architecture and the vibe that this cities give off. Hope you liked this post, stay tuned for more! If you have any requests for my next post, please comment down below!